Some RAs at Hillsdale may think that their weeklong training to get ready for the school year is a burden, but it could be worse. Simpson RAs Josh Bailey and Adam Buchmann would know. They have been through Officer Can­didate School for the Marine Corps. Senior Josh Bailey fin­ished Officer Can­didate School this summer and now just has to wait until grad­u­ation before he com­mis­sions. He fin­ished OCS in two sep­arate, six-week phases, one the summer after freshman year, and the second just this past summer. After being exposed to the Marine Corps in the first six-week training session, Bailey felt better about the second session. “The second time I went, I felt a lot more pre­pared to deal with it and I feel like I per­formed well while I was there. And the thing that was most dif­ficult was keeping a good attitude about it. Because the second time you go back you feel like ‘I’m just sitting here getting screamed at, like why the heck did I come back to this?’ So keeping a pos­itive mental attitude was dif­ficult there,” Bailey said. This summer they tested his lead­ership abil­ities by putting him in dif­ferent posi­tions and sce­narios where he was in charge of his peers. One sce­nario OCS puts its trainees through is a reaction course. “So it’s like here’s a broken bridge and you have to get over this water. You have this rope and you have to carry these two boxes of ammu­nition over and you can’t touch this, this, and this. And you have 5 to 10 minutes and you have to brief your team. You have to write out an order and give it to them and then lead them through that order and try to com­plete that mission. Most of the time you fail. Almost all the time you fail. But they want to see how you deal with it,” Bailey said. In addition to these chal­lenges Bailey was also in classes that teach tactics, weapons training, mil­itary eti­quette, and ethics. Of course there was also the physical training and chal­lenges that OCS is famous for. “You have PT every morning. And you have to go out at five in the morning to go workout. You have to do that every morning and on top of that you are getting hazed throughout the day,” Bailey said. Bailey admits that right after fin­ishing OCS he was ready to move on and wasn’t nec­es­sarily excited to come back to being a student. “After OCS this summer I was just like, let’s go, let’s get through Hillsdale. But as the summer pro­gressed, I got back into the Hillsdale mindset. Like, I’m still a college student, and I’m happy to be here for another year. And it will be dif­ficult to leave Hillsdale because I’ve got lots of friends here. But it does help to know what I’m doing and I’m excited,” he said. Junior Adam Buchmann is also going to be a marine and com­pleted the first part of OCS last summer. Buchmann knew before he came to college that he wanted to go into the mil­itary. In high school he applied to the Naval Academy, the Mer­chant Marine Academy, and Hillsdale. He was accepted to all three, but later dis­qual­ified from the mil­itary acad­emies becuase of an ankle injury that required recon­structive surgery. So he came to Hillsdale, but still knowing that he wanted to pursue the mil­itary. During freshman year, he went to Ann Arbor to talk to a selection officer about what he wanted to do in the marines. “And the marine corps is the only branch that, prior to com­mis­sioning, can offer you a flight con­tract. I’ve always wanted to fly, so I signed up on a six year flight con­tract, if I’m able to earn and then accept my com­mission,” Buchmann said. 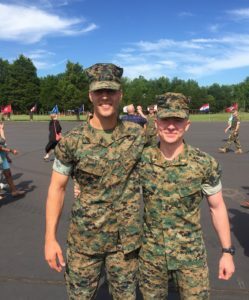 He fin­ished his appli­cation, got accepted in Feb­ruary of his freshman year, and visited Quantico, Vir­ginia for OCS in the summer. Buchmann went into the training process with some famil­iarity after watching his older brother, a marine, go through it. The training is con­stant and you are con­stantly under eval­u­ation, Buchmann said. Even though it’s extremely intense, he had a few good stories. “There was another can­didate in my platoon who was 6’8”. He was taller than every single one of the sergeant instructors. One time he acci­den­tally mis­ranked the company gunnery sergeant and called him the company staff sergeant and within half a second he was sur­rounded by the company gunnery sergeant and 4 or 5 other sergeant instructors. And when they are screaming at you you can’t make eye contact with them, you just have to stand at the position of attention and look straight forward. It was so humorous because it was like five angry yelling marines, looking up at this kid. And he’s just standing there with this straight face and they are standing there with their heads at his shoulders. And they are just all looking up and screaming. And he has this face like an ostrich, it was so funny,” Buchmann said. Buchmann will finish his second six weeks of OCS this summer. Bailey will com­mission this May when he grad­uates, and Buchmann will com­mission next spring. Needless to say, after weeks of training to be leaders in the Marine Corps, Bailey and Buchmann were ready to be leaders in Simpson as well. Their fellow RA, Junior Stephen Richmann, can attest to this. Abby Liebing is a junior at Hillsdale College studying history and journalism. good for these guys. nice work.